The increasingly polluted Yamuna River is one of the largest, most commercially important, and sacred of all rivers in India. 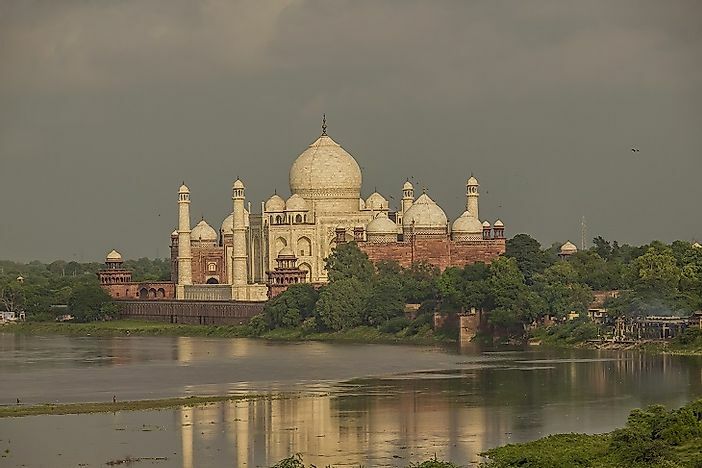 The Taj Mahal upon the banks of the Yamuna. The Yamuna, one of the most sacred rivers of India, arises from an elevation of 6,387 meters at the Yamunotri glacier in the Bandarpunch massif in the Himalayas in the Uttarakhand state of India. It then flows for a distance of 1,376 kilometers to join the Ganga River at Triveni Sangam in Allahabad. From its source, the river flows south through the Himalayan foothills of Uttarakhand into the Indo-Gangetic Plains. Through its course, the river traverses the Indian states of Himachal Pradesh, Haryana, Delhi, and then flows entirely through Uttar Pradesh, flowing through some of that state’s major cities, such as Mathura, Agra, Firozabad and Etawah, before finally draining into the Ganges. The Tons, Chambal, Sindh, Betwa, and Ken rivers are some of the major tributaries of the Yamuna River. The Yamuna drains an area of 366,223 square kilometers, which comprises 40.2% of the entire Ganges Basin. The Yamuna River holds a special place in the hearts of the Hindus of India. The river finds mention in several ancient Hindu texts like the Rigveda, Atharvaveda, and the Bhrahmanas. Many legends and folklore tales relating Hindu Gods, Goddesses, and belief systems to this river have been a source of inspiration for ancient and modern Hindu literature, art, and sculpture, all based in part on descriptions of the Yamuna River. Foreign travelers and invaders also have introduced the river into their own accounts and travelogues. For example, the Greek traveler Megasthenes mentioned the river in his famous text Indica, while the accounts of Seleucus I Nictator, an officer of Alexander The Great, also refer to the details of this river. Many great empires of ancient India, like the Maurya, Shunga, Kushan, and Gupta empires, flourished along the banks of the Yamuna. Many capital cities of these prosperous kingdoms, such as Pataliputra and Mathura, also grew up along the river's banks. In Agra, the Taj Mahal was built along the rivers banks in the 17th Century under the commission of Mughal Emperor Shah Jahan. The Yamuna River is of great economic significance to India today. The river drains a highly fertile area along its course, and its waters irrigate vast tracts of agricultural lands in the states of Punjab, Haryana, and Uttar Pradesh. The waters of this river also help in satisfying the domestic water needs of major cities and towns along and beyond its banks, including Delhi, Agra, and Mathura. The river water feeds major canals like the East Yamuna, West Yamuna, and Agra Canal, whose waters are utilized for irrigation and industrial purposes. Besides economic importance, the Yamnua River plays a major role in Hindu religion and spiritualism. The Triveni Sangam in Allahabad, where the river meets the Ganges, is the holiest pilgrimage site of India. It is also where, every 12 years, the Maha Kumbh Mela is held, witnessing one of the largest peaceful gatherings of people in the world. Nearly 120 million people (mostly Hindu pilgrims) visited the last Maha Kumbh Mela in 2013. The river is also worshiped at various other points along its course, and thousands of Hindu temples and shrines are built along its banks. Tourism also thrives along the Yamuna River basin, which is also home to the world-famous Taj Mahal. The Yamunotri glacier, the historically famous cities of Delhi and Agra, and the pilgrimage sites of Haridwar, Ujjain, and Allahabad are all also major tourist spots along the course of the river as well. Though the Yamuna River Basin drains vast tracts of land in northern India, most of the land area of this basin is devoid of wild habitats. and is one of the most densely human-populated river basins of the world. Major Indian cities and towns are located on the banks of this river, and thus most of the native vegetation of the river basin has been cleared for cultivation, The native flora and fauna of the Yamuna River Basin is today primarily limited to the upper reaches of the river, ranging from the Yamunotri glacier to the Himalayan foothills in the states of Uttarakhand and Haryana. The Kalesar National Park in Haryana is a sal forest in the Shivalik Hill region based along the banks of the Yamuna. Here, sambhars, chitals, wild boars, porcupines, monkeys, and a variety of birds populate this forest. The river waters of the Yamuna, besides housing a plethora of fish species like rohu, catla, and mrigal, also serve as one of the last remaining habitats of the critically endangered gharials and the Gangetic river dolphins. Today, the Yamuna River is one of the most polluted rivers in the world. Human sewage forms the bulk of the pollutants entering the river, while wastes from industries, agricultural run-offs, idol immersions, and human ashes also pollute the Yamuna. More than 400 million gallons of sewage enter the Yamuna from Delhi alone. Millions of dollars have been spent by the Indian Government to save the waters of the Yamuna, but a general lack of public awareness levels and high rates of corruption have severely inhibited such efforts. Very little fresh, clean water remains in the lower course of the Yamuna River by the time it joins the Ganges in Allahabad. The high level of pollution have almost completely degraded the water quality of the river, rendering it unfit for human consumption. Aquatic species dwelling in the river, like the Gangetic dolphin and gharials, are nearly regionally extinct as a result. Above of all of this, the dangerous threat of climate change and global warming exists as well, which has the potential to melt the Yamunotri Glacier in the near future, drastically altering the water levels of the Yamuna, initially leading to large scale flooding, followed by equally severe droughts.